Mauerbrecher issues, any hope for buff? So first off, I have to declare, that I am no unicum player, and this is my first topic in this forum, so try not to be too hard on me. I am a big fan of superheavy tanks, and I have been grinding through the german tech tree before, and I quite enjoy playingthe E-100 and the VK-100 aswell. During last months top of the tree, I stumbled on the Maurbrecher. I noticed that this tank was released long ago, and that this was supposed to be a super heavy crew trainer, however as reviews suggested, it is quite lacking. Since I didn t see much, I could tell that it had some problems for sure, but I bought it anyways. Regarding the tank the biggest pros I noticed are the high alpha gun, and the 6 cewman training capacity. The cons however were overwhelming. - 30 mm inner lower hull armour, next to the tracks, that can be autopenned by 90mm guns if I m correct, making it impossible to sidescrape. NOTE: I really feel this 30 mmarmour next to the tracks kills effective use of your armour and skill play. Its been out for a while, and so far Wargaming didn t bother to touch it much. Does anyone know anything about an upcoming buff? Should I hope or just accept that this tank is not really viable? Don’t get your hopes up, maybe in the announced global rebalance that may or may not come within 2 years (I start believing their promised thing once they at least hit supertest). T-44-100, T-54 mod 1 or just Russian meds in general are more likely to get buffed before the mauerbrecher are. Do show me which Tier IV tanks have 150mm standard ammo pen because I haven't found them yet. 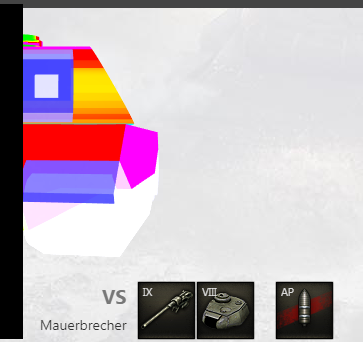 The Mauerbrecher is actually one of the few *properly* balanced super heavy tank in this game that has viable weak spots for same tier *STANDARD* ammo. What you are describing is a balanced heavy. Good armor with some weakpoints. If you mean by "inner lower hull" the hull behind the tracks, then it's 60mm and not 30. So only 181mm guns will overmatch it. If the armor meant something against T10 tanks what could T6-8 tanks do? If you remove all the weakpoints then what could those tanks do? Load some gold and the armor becomes paper. That's basically the same for all armor. Just slap a few more bicycles on it to act as HEAT screens and it should be OK.
hull,yet it feels lacking, especially if you compare it to its non premium counterpart. Plenty of T6 tanks have 150+ pen with STANDARDvrounds, for example the ARL 44, but look them up on tanks.gg, there are quite a few. During the rental time I realized my stock VK 100.01 P is better than a fully unlocked Mauerbrecher. Guess that says enough. Yeah, now you only have to realize that VK 100.01P is overpowered which makes it a very bad indicator how a balanced tier 8 should look like. In that case then yes, you are right, there are enough Tier 6 tanks with 150 pen indeed! I don't think VK is overpowered. With all the gold spam and MM, no T8 can be overpowered. The armor is a little bit too much but the mobility is super bad which balances the tank in my opinion. Sure, tell that to all those tier 6,7 and many tier 8 tanks which can't hurt VK even with premium ammo. Also, even if armour fails, VK has 1700 HP and 440 alpha (minimal exposure time) which makes it a lot better than most tier 8 heavies. Broken tier 8 MM is not a balance factor. It will be fixed or adjusted in the future but VK will stay as it is - except it will see a lot more tier 7 and 6 battles. If they reduce the cupola armor, it will be balanced. Now it is definitely not OP in my opinion. It is slow, and faces T9 and T10. I think I have seen T6 only once. And with all the gold spam people have no problem shooting the tank through the turret. This tank is literally a T8 Maus. You have your opinion and I got mine and in my opinion it is not OP. The fun thing with the Mauerbrecher is that people are so focussed on shooting the cupola that they rarely ever bother with the other weakspots, I don't think I've ever been hit in the MG port in ~50 games of it. Even facehugging people, they'll try going for the cupola, at least from my experiences. Do think that the inner side armour should be changed a bit, while I do agree that overangling should be punished through trackhits, its a bit excessive in the Mauerbrecher imo. Having an opinion doesn't stop your from being wrong, though. No, because it's not Russian. Well it's German and in WoT Most German tanks are supposed to be trash so it's unlikely.